So after a bad heartbreak late 2014 and pushing to move on through 2015, one thing I did was sort of build a wall and I have never really allowed myself feel. Whenever I had people around me who would want to get to know me as soon as they start showing or expressing how they feel, I start pushing them away unconsciously at first, then consciously. Even with my female friends, I really don’t make new friends because I’m very weird when it comes to my emotions. I’m a nice person so I’d smile if we talk but once I begin to feel I might need you as a friend or whatever I run away. 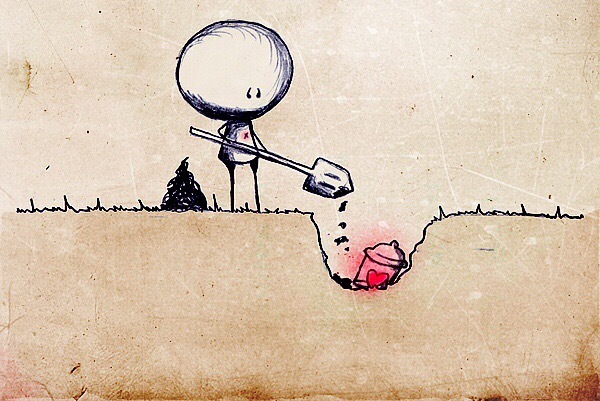 So I guess I sort of buried my heart because I don’t want to be vulnerable again. This can never be a solution to not being hurt. Yesterday, the Holy Spirit reminded me that God’s word is really everything I need to help me go through life and that He has told me to guard my heart. What does this mean? Sin begins in the mind before a person carries it out. So to guard my heart, I was to (and still supposed to) dwell on things that are pure, right, noble, lovely (Philippians 4:8) Avoid anger, pride and of course temptation. Did I do this? Sadly no. Twice this year, I’ve tried to open up emotionally and it didn’t go well. In January, there was distance, I didn’t mind trying to see if things will work but he said the distance was major for him. I think he just wasn’t ready to make any commitments. In September, his family wasn’t okay with my tribe. We don’t want a Yoruba girl so don’t bring her home. Yes, I’m still in shock. I only saw this in movies growing up. Both times I was hurt and it is because i didn’t pray before allowing myself feel or even pray about the person to hear from God. Instead, I got carried away with my feelings. Maybe I got tired of always running away and then the two times I decided to try, it didn’t work out. Keynote is to always guard your heart. Think on the right things. Before you make a decision or go into things to be sure God has okayed it so you don’t get hurt. So touching & complete truth;Learnt few things too.